Without a doubt, accounts become truly muddled when you don’t know what you are talking about. First, no matter what your U. S. history teacher taught you in school, Lee Oswald did not assassinate Jack Kennedy. Just educate yourself on this matter. Read James Douglass’s JFK and the Unspeakable: Why He Died and Why It Matters. You do not want to be ignorant about this critical event in our history. When you understand what happened to JFK, and why it happened, you will never see your country’s government the same way again. Once you know that Lee Oswald did not kill President Kennedy, the possible connection between Oswald and Rafael Cruz in New Orleans during the summer of 1963 takes on a different cast. Both men were involved with the CIA’s efforts to unseat Fidel Castro and his regime in Cuba. Rafael Cruz worked as an anti-Castro exile – who fought for Castro before Castro turned to the Soviets. Lee Oswald worked as a low-level CIA operative who undertook a variety of jobs in New Orleans to assist his employer’s anti-Castro efforts. 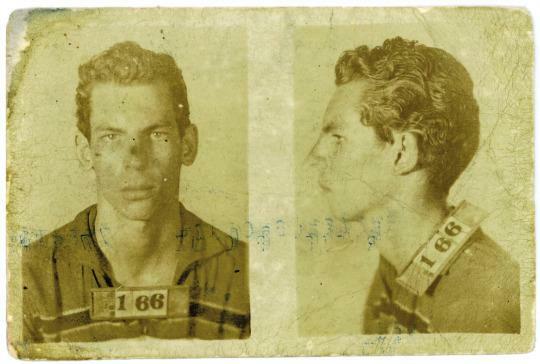 Rafael Cruz’s mug shot at age 17, when he was arrested in Cuba for fighting against Batista. To say Cruz and Oswald worked together in New Orleans fifty-three years ago, certainly does not suggest he was involved in the plot to murder JFK. To illustrate muddled thinking, that means Rafael Cruz assisted a lone nut who, by official accounts, hatched a deranged plot to assassinate President Kennedy by himself. To the contrary, Oswald tried to warn officials in Chicago that Kennedy’s life would be in danger if he traveled there. Kennedy’s people in Washington cancelled the trip. Abraham Bolden, a Secret Service agent who also tried to warn government officials about the plot to assassinate Kennedy in Chicago, went to prison for three years, on manufactured charges, for his trouble. Lee was executed by contract killer Jack Ruby for his. Once you understand that Oswald worked for the CIA, you can make sense of mysteries in Oswald’s life, as well as strange events that preceded Kennedy’s public execution in Dealey Plaza. Lee Oswald had contact with a fair number of people during his time in New Orleans. He was not a desk jockey: the CIA wanted him in southern Louisiana to keep his shoes on the pavement, to do the kinds of jobs their regular agents either would not or could not do, as they would be too conspicuous. Oswald could move about among various groups, and no one knew who actually paid him. As for Rafael Cruz, not many Cuban exiles in the United States cared for Kennedy after the Bay of Pigs, but to say Cruz was involved in Kennedy’s assassination because he worked with Oswald in New Orleans is nonsense. The National Enquirer suggests Cruz and Oswald collaborated to hand out flyers for the Fair Play for Cuba Committee (FPCC). This committee existed to help CIA keep tabs on anti-Castro activities in New Orleans. Even more importantly, Oswald launched FPCC in New Orleans to help CIA gather information about Cuban intelligence and internal security people, positioned to block CIA’s campaign to undermine Castro. The National Enquirer published enlarged, grainy black and white photographs to show someone who could be Rafael Cruz in his early twenties. The Enquirer does not tell us why they think the man in the photographs is Cruz, or at least the online coverage of Trump’s accusations does not contain any detailed evidence. I would love to know, independently of the Enquirer‘s photographs, what we know about Rafael Cruz’s activities during the summer of 1963. Ted or Rafael Cruz certainly won’t tell you. It’s an interesting historical question that reaches all the way to the 2016 presidential campaign. Trump, with his outsize ego, always acts as if he knows what he’s talking about. He swaggers every time he opens his mouth. Meanwhile journalists emphasize Trump cannot get his facts straight, yet journalists don’t know what happened either. Everyone talks with such self-confidence, with no grounds for it. Judyth Vary Baker writes via Facebook that Rafaelo Cruz, as people called Ted Cruz’s father at the time, served as an informal bodyguard for Lee Oswald on August 9, while Oswald handed out FPCC flyers in New Orleans. Her recollection tells me the National Enquirer photograph is authentic. Oswald opened himself to abuse and attack for the FPCC operation, and in fact New Orleans police arrested him for it. The man had physical and moral courage. As early as July, Oswald began to believe his employers in Washington would betray him. He even tried to escape their long arms in Mexico. It did not work. The CIA had him arrested on November 22, and executed on November 24. In addition to Douglass’s book, read Judyth Vary Baker’s Me & Lee. No better account exists of Lee Oswald’s activities while he lived in New Orleans, before he moved to Dallas in fall of 1963.